You'd think that now that I've left education that maybe I would stop with these posts, wouldn't you? Well, I've been wanting to do this post for a long time, and it just so happens that I have a little time on my hands right now. 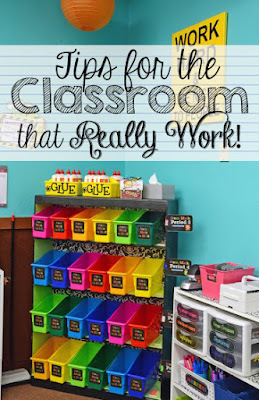 I've been snapping pictures for awhile of tips that have been successful in my classroom and that have saved me time. I couldn't leave those pictures unused without sharing them with people who could potentially use them. So here goes . 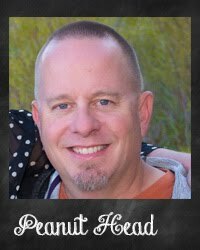 . .
You see, my classroom was a quarter mile (roughly) from the teacher workroom, and most every time I visited that room, I left my brain back in my classroom. This little stash kept me from having to hike that extra half mile to my classroom and back when I forgot things. As any teacher can tell you, the teacher work room is always missing something. Teachers like to walk off with the very thing that you need. For crying out loud, teachers will even take that three foot by three foot paper cutter back to their classrooms, and there it will sit until you no longer need it. It's frustrating. Do I sound bitter? Because I'm trying to keep that under wraps somewhat. Anyway, in my emergency kit I kept paperclips, a pen, a pencil, an eraser, a highlighter, a black felt tip pen (for tweaking my originals), a ruler, Post-It Notes, and Dryline Correction film. The only thing I didn't keep in my mailbox is a stapler, and that was because staplers have a way of walking off. 2. You need a Pair of Pliers. If you can swing it, a whole tool kit, but at least a pair of pliers. 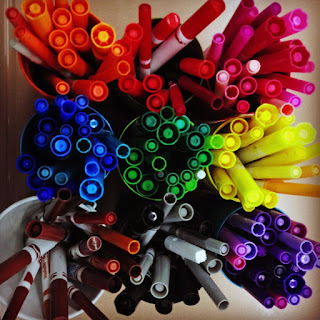 I once wondered on this blog when talking about the beginning of the year school supply list "WHY do teachers ask for so many dry erase markers? Really! Eight dry erase markers?!!!" Well, I'm here to tell you, YES, EIGHT. And honestly, a nice even dozen would be even better. 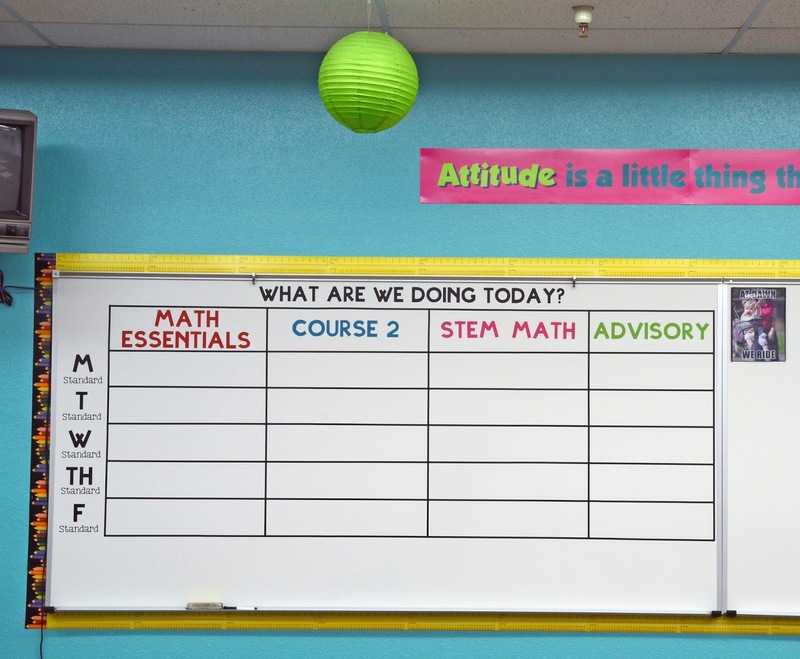 The reason is because the students use those markers on their student white boards when we are doing guided practice. You would not believe how fast you go through these markers in the course of a school year. It's frightening, really. Anyway, I always keep a pair of pliers at the ready because some students have, ahem, self control issues, and they press too ding dang hard when they write. Teachers simply cannot afford to throw away a dry erase marker that is not for reals all dried out. So when Little Sweetie presses too hard and then comes up to me and shows me his (or her, but to be honest it is usually a him) marker with the tip pressed all the way in, I just hand him the pliers and tell him to get digging. It works too. They pull the tip back out and get on with the lesson. I simply could not have lived without pliers in my math classroom. This is one of those things that I believe I dreamt up on my four minute commute home. I was muttering to myself, "Why the ding dangit can't my students copy the assignment from the board onto their papers without missing problems? It is not rocket science. Is it really that hard?" Well, you know the answer to that question is, "Yes. It really is that hard." I throw my hands in the air and submit. Okay. Fine. I will give you the assignment written down for you, but in the end it is going to benefit me more than it will benefit you because I have demands. This assignment strip must be glued to the top of your paper, not stapled or taped, and you MUST WRITE YOUR NAME ON IT! I know this will tax you inordinately, my Little Pretties, but it must be done and it must be done with a smile on your face. It can be a pained, fake smile, but it will be a smile. By the way, yes, they do think I am crazy, but they are fine with it. Crazy entertains them just as much as awkward adolescence entertains me. 4. Give your students neat freak standards for how their homework will be done, and they will follow them. This tip came to me via a student and her former elementary school teacher. I was in love with it as soon as she told me about it. It's pretty simple, but students have to fold their paper in half twice horizontally, and then twice vertically, which will give them 16 boxes on the front of their paper and 16 boxes on the back. Granted, my assignment strip takes up four of those boxes, but there's still room enough for 28 problems. This is a good thing because I tend to assign a lot of homework, and this limits me to 28 problems. Most days they don't have 28 problems, but they can, and that's good enough for me. Also, sometimes they will need more than one box for a problem. I also like them to highlight the box borders. I love this method because the homework is neat and easy to grade. It is also obvious right away if they just copied their answers from a friend or if they showed their work. This will save you time when you do sub plans because everything is there and you don't have to go searching for it. The basics for me were a general schedule, seating charts, phone list, room list, emergency drill procedures, map of the school with evacuation route, and the names of teachers to ask for help and their extension numbers. This is an example of one day's sub plans. I kept sub plans in a folder on my computer, named by date, and that saved even more time because I could just change what I needed to for that day. I had a few different versions--full day, early release schedule, and half day. 6. 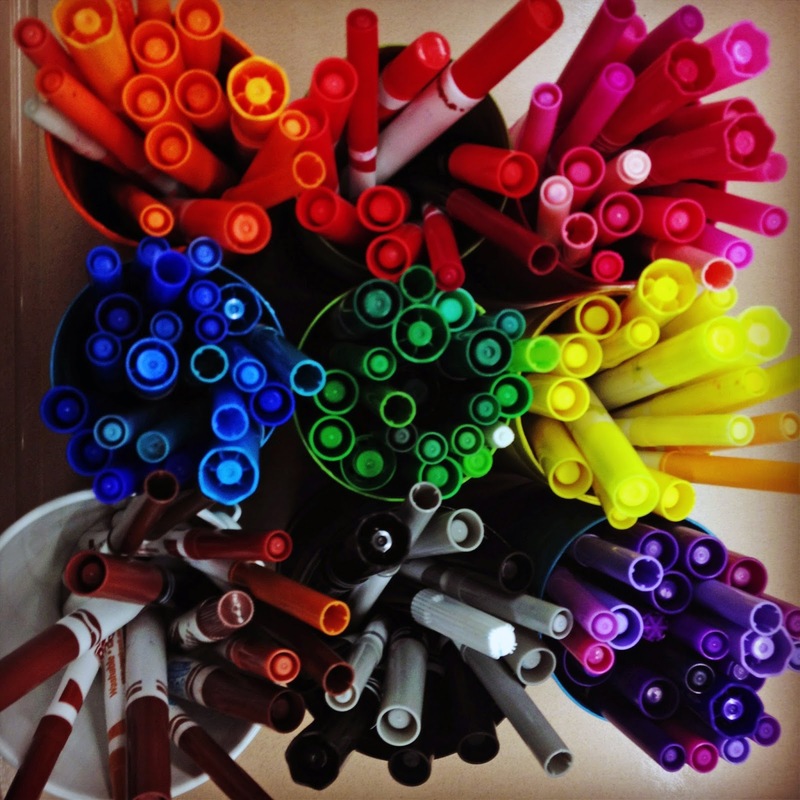 Sorting pencils, crayons, and markers by color is awesome. A couple years ago I raided my girls' stash of old, used school supplies, and sorted them by color into these five-drawer units. Whenever my students needed specific colors for their notebooks, finding the colors was fast and easy. Then last year I was also fortunate enough to have desks with little baskets under the chairs. 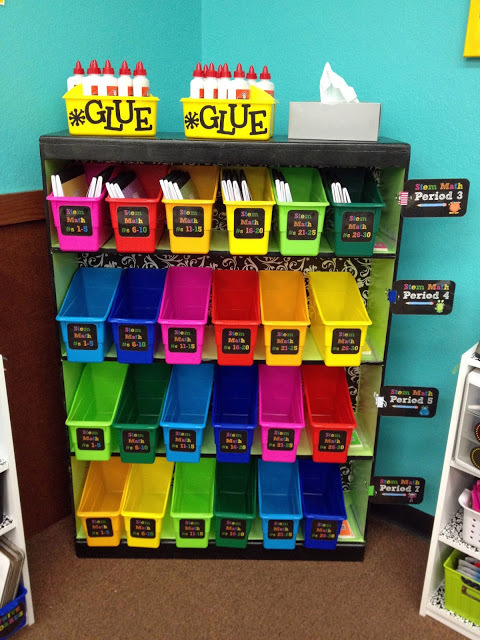 I used those baskets to put students' white boards and a supply box which I filled with a pack of markers, a pair of scissors, a highlighter, a dry erase marker, and a mini white board eraser. This saved a lot of time when they needed to access their supplies. As you can probably imagine, although I did not have the foresight to see this coming, students were unable to keep their supplies inside their boxes. I was constantly finding markers on the floor. Constantly. 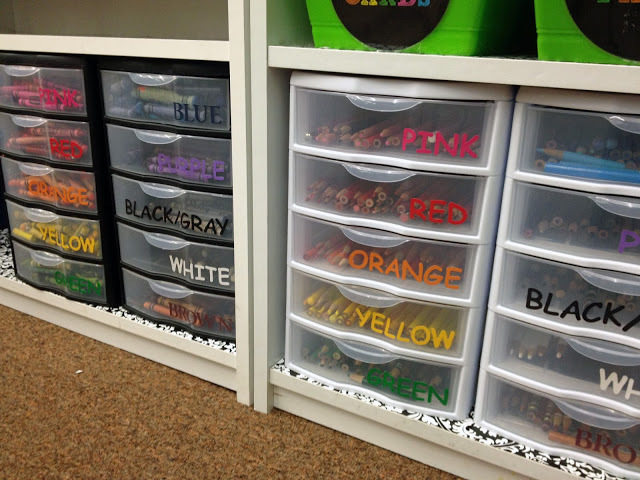 There was no way I was going to start searching through boxes to find the right box for each rogue marker, so my solution was to just put them in a temporary home where students could retrieve them when, if ever, they realized that they were missing a certain color. It worked exactly as I had planned. 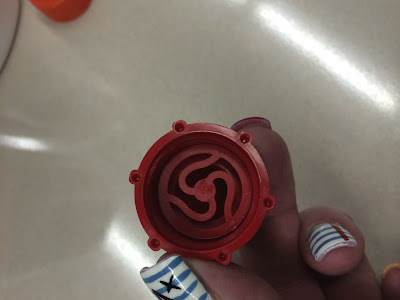 It turned out that my sevies were very conscientious about keeping the supply boxes stocked and organized, but then my eighth graders would come in and purposely put red caps on blue markers and such just to annoy them. It was sort of amusing watching this back and forth. My sevies would get so upset. 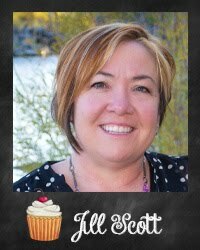 "Mrs. Scott, the person that sits at my desk keeps mixing up all the markers and lids, and I've fixed them like five times! Can you please tell them to stop?!" And honestly, ain't nobody got time for that. It was an object lesson in letting go for my sevies. A painful one. In addition to the markers by color, I had these little drawer units for the stray and extra highlighters, dry erase markers, white board erasers, and scissors. 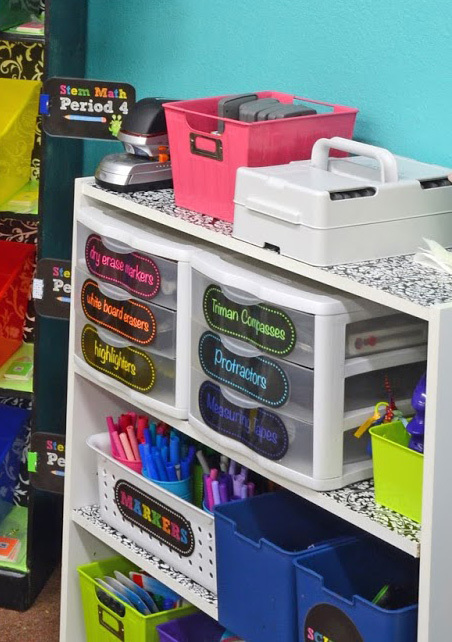 I love these drawer units for organizing my classroom because they make it fast and easy to access supplies. 7. 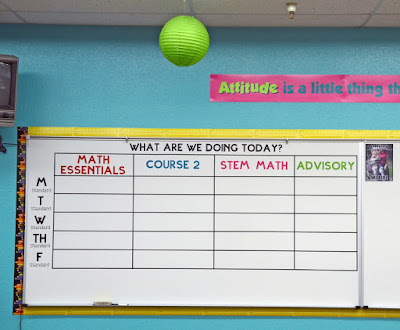 Designate a specific area on your board for the daily schedule. They will never stop asking you "What are we doing today?" Even when you write it on the board above the daily schedule. I've gotten to the point where when they ask the dreaded question, I simply point to the board. I'd like to tell you that that settles that, but it does not. They like to complain just to hear themselves complain. They will go on and on, "But I don't want to r-e-e-e-e-a-a-a-d. I'm too l-a-a-a-a-a-a-zy." To which I respond, "Well you have a personal problem then." Regardless, they like to know what they will be doing every day, and even if they complain about reading the agenda, they will still read it because they want to know. 8. Library book bins are the perfect way to corral composition notebooks. I have tried many different ways to manage storage of notebooks for multiple classes, and this ended up being the best solution for me. I assigned five students to each bin and every student put their notebook in the same place every day. That way it is fast and easy to locate their notebooks when they come in the next day. I bought my bins here. 9. 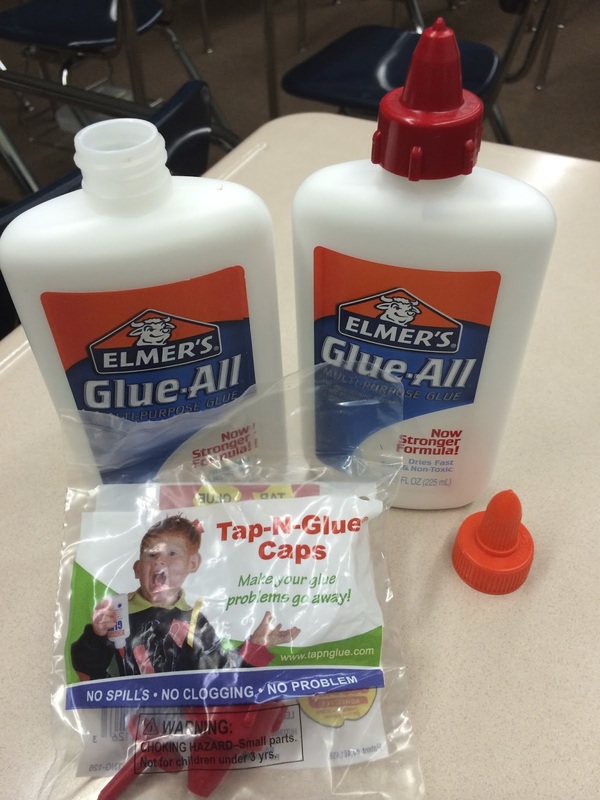 Replace regular glue caps with Tap-N-Glue Caps. These things are amazing. I'm not kidding. 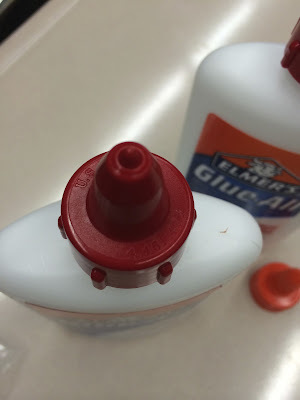 There is no need to remind students to close their glue bottles because it is automatic. You just press down and drag, and just the right amount of glue comes out. It saves so much glue. You can find them online here. With six math classes using these 8 oz. bottles, I only had to refill my bottles once this year. The glue caps come in two pieces like this. The pointy piece is the part that keeps the glue closed. When they press down on it, it allows a small amount of glue to come out. When they lift the bottle off the paper, the bottle closes automatically. This is what the underside of the glue cap looks like when the pieces are put together. 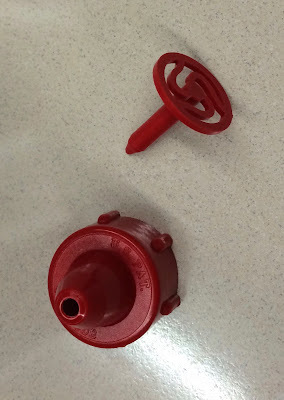 The only drawback to these caps is that the first set of students to use them every day have to pick the glue boogers off the caps to free up the flow. And honestly, it's not a big deal. You will never have to take the caps off to unclog the glue bottle. In fact, I make it very clear at the beginning of the year that students are not to unscrew the glue caps, under no circumstances, EVER. To do so would risk my wrath being unleashed on them in a very unpleasant manner. 10. Number all your decks of cards and every card within that deck. You would think that this wouldn't be necessary, but trust me, it is. Save yourself the headache of trying to figure out which deck the stray card goes in, and just do this. Or better yet, have your students do it for you. That's about it. Those ten tips were some of the biggies for me, and they really made a difference in how smoothly my classroom ran. Now that I've shared with you what worked, I'm going to show you one of the many things that did not work for me. I know this is hard to believe, but the Bieber Fever pencils did not work. I was hoping that the students would be so horrified to touch these pencils that they would come to class prepared every day. Nope. That is not what happened. I had 144 of these suckers made especially for me, and every last one of them disappeared. Some of the girls secretly love Justin Bieber, and the boys just love to torture the pencils as if their voodoo pranks would directly transfer to the Bieb himself. One of my students brought the remains of one of these pencils back to me. He had found it in a vice in the wood shop classroom. It suffered greatly. And I had such high hopes . . . Thanks for sharing! I haven't thought of using pliers to fix markers and I haven't heard about the glue caps I teach kindergarten and we sometimes use glue bottles so I will have to get some of those caps. Thank you! The glue caps are awesome. You will love them. Well done, as usual, Jill! I'm surely going to miss your education posts, but I'm so happy for you for choosing to do what's right for yourself. Most wouldn't have the gall to do it! You are truly an inspiration, in more ways than one! Thank you, Tiffany. Instead I'll be reading your education posts and living vicariously through you. I know I will miss teaching. This is probably one of the hardest decisions I've ever made. One tip that I'll add to your list: become friends with the custodians and request that if they find school supplies in the garbage cans at the end of the year when students clean out their lockers, to bring them to your classroom. Many times, student throw perfectly good or even new notebooks, pens, etc. away at the end of the year because they do not want to carry them home. I can't tell you how much money I saved on supplies by going through the garbage cans. That is fabulous advice, thank you! I was going to try those glue trays with the sponges but maybe I will give the glue caps a try. I would add scissors and tape to my teacher room stash. I am famous for cutting up different test questions and reassembling them to call them my own. I thought about trying the sponges too, but I was worried about students dropping or throwing them. #middleschoolproblems I didn't include scissors and tape in my stash because that was usually provided in the work room, but it is a great suggestion. Thank you! I tried the glue sponges in my fourth grade class and was not a fan. Even after training my kiddos on how to use them, they found many ways to abuse those poor sponges and still made the glue gloves that elementary kids LOOOOVE to make! I have elementary-age kids and when we use liquid glue, we use paint brushes (most of the time we use glue sticks). Great post! I was in stitches by the end. Love your honesty and humor. This was the best blog post I have read in a long time, and I read a lot! 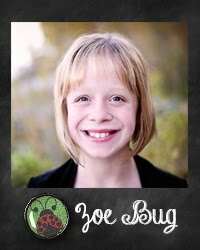 I am starting my first year teaching a 3-grade split of 4s, 5s, and 6s! Thank you for the tips and the giggle!! Thank you, Haleigh! Wow, three grade levels together? You are a better woman than I. I wish you the best of luck! Im teaching 7s.. and the tips surely very useful for me.. thank you again. You are welcome, Nida. Have fun with your sevies. I did this same thing to keep track of my calculators, and it really does work. You guys are cracking me up! I need to do this! I have the worst pencil thieves! The 5th grade math teacher on my team last year only had GOLF PENCILS....so if you didn't have your own pencil, that is what you got. Worked like a charm :) I thought it was genious...because I killed a forest. I swear my kids ate the pencils. It's exasperating, isn't it? I don't know what it is that makes them want to press down so hard, but I was losing way too many markers before I brought out the pliers. I'm glad I could help. Thank you for stopping by! I love this! This may have been addressed before I I'm just not seeing it, but where did you get your labels? I love the ones for the drawers and book bins. Pliers for the dry erase markers! Why did I not think of this. Raiding hubby's toolbox right now!!! Jen, It will be worth it to just buy a pair of pliers to keep at home. You'll use them every day. My husband and I both enjoyed your final words about the pencils....too funny!! Labeling card decks was one of the best things I ever started doing in my classroom a few years ago...saved me hours and my little kinders caught on to the system quickly! I label with numbers or colored dots. I also do this with game pieces, especially with games like memory when it comes with a billion pairs and I want to split the game up so two groups can use it-I just put two bags in the box with a colored dot on each bag and the same color dot on half the pairs. I love the tip about the glue caps. I always use glue sticks because I hate the waste of glue bottles, and unclogging the tips, dealing with the mess...they are on my amazon shopping list already! What would we do without each other? Other teachers are the best source of tips for the classroom. That's exciting, Ashley. I wish Pinterest was around when I started teaching. It's an amazing resource. That and Teachers Pay Teachers. We are very fortunate to be living in the digital age. Love this post! Also enjoyed the share of something that did not work. I got a laugh out of it. Great post! FYI...the store, "Teacher Direct" for the Tap n Glue Caps is closed down. Thank you for the heads up, Stacey. I've found another link that works and updated it. School Specialty.com has the best price of $2.46 compared to Amazon at $4.95. If you buy at least $49.00 worth of stuff at School Specialty you pay no shipping. Classroom Direct has them for 0.97 a piece. Classroom Direct has the caps for 0.97 each. Love these tips! I am starting my first year of teaching this year and these are great tips! Random comment: I noticed your teacher themed nails haha. Do you by chance have a picture of your full hand when you had those nails? I am hoping to get my nails done with a teacher theme before my students arrive in a couple weeks! I didn't take a full picture of my hand, but I do have the original pin that they were modeled after. The only thing I did different was to make the ruler yellow. You can find my pin on my Back to School board. My Pinterest name is Controlling My Chaos. Love your ideas! I teach grades 4-7 and have some of these same issues. An idea for the pencils...I tried using hot pink pencil that said "It's a girl!" thinking no student would want to walk with one of them...but we found them all over our school! so now I do the following: I keep a classroom set of pencils- the kids can use one while in class but they have to leave me their agenda or a shoe. When they return the pencil they get their shoe/agenda back! I was skeptical about the "one-less-shoe" being an issue but I haven't had a problem yet (and this is my 4th year of doing this!). I used to do this, but working in a low-income school, this became embarrassing for some kids with dirty, "holey" socks. :-( Plus, sometimes the smell of middle school feet after gym is excruciating! It's too easy for kids to forget their planner (unless your school doesn't allow them to be in the hallway without them). When I had my own classroom, I kept a cup of golf pencils at the end of my desk for the students to borrow. When I was a traveling teacher, and now that I'm a substitute, I have misprint pencils; the current batch says "Fabulous First Graders." Misprints can usually be purchased from the same supplier you order your custom pencils from, and they are sold by the gross at a DEEP discount. What a great tip. Thank you! What is wrong with Fabulous First Graders? Thanks for sharing! 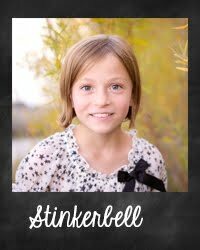 I loved reading your blog and you are so funny.